IN TIMES of political dysfunction courts have “no choice” but to intervene, a renowned South African judge told lawyers and human rights activists in Belfast. Edwin Cameron is an internationally acclaimed figure who is currently a Justice of his country’s highest court and who during the Apartheid era was a human rights lawyer hailed by Nelson Mandela as "one of South Africa's new heroes". Justice Cameron has also campaigned for LGBTI rights, which included speaking publicly about his own life as a gay man and becoming the first senior official in South Africa to reveal he is living with HIV. 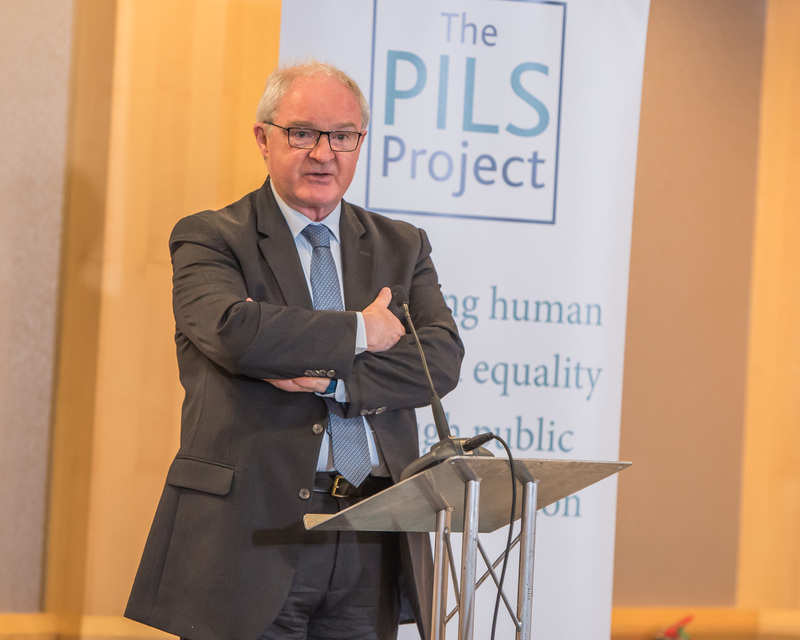 He gave the keynote address at a conference organised by the Public Interest Litigation Support (PILS) Project, a not-for-profit organisation set up in 2009 to support the use of the law to advance human rights and equality in Northern Ireland. “My impression has been very strongly that public interest litigation is very, very effectively, innovatively, imaginatively, and creatively used in Northern Ireland,” Justice Cameron later told The Detail. But he added: “My impression from two days of meetings is people are very troubled. They are troubled by the peace process that seems to have not just ground to a halt, but to have retrogressed. The conference included lawyers and campaigners who have challenged government. Solicitor Ciarán Moynagh spoke of cases challenging the absence of marriage equality in Northern Ireland. Ciarán Mac Giolla Bhéin of Conradh na Gaeilge discussed campaigns linked to Irish language provisions. The event also heard from Sarah Corrigan of the Housing Rights organisation which has had an impact across the UK. The Lord Chief Justice of Northern Ireland Sir Declan Morgan opened the conference with a speech that raised a range of issues, including efforts to deal with the legacy of the Troubles. He highlighted the prospect of an oral history archive as an under-used mechanism to encourage better understanding of the past and to aid reconciliation. And on the broader issue of courts making rulings on controversial subjects, the Lord Chief Justice said the media played a critical role in reporting the reason for decisions. Lord Chief Justice Sir Declan Morgan. Photo courtesy of the Public Interest Litigation Project. Justice Cameron later drew on his South African experience to defend the role of the courts in matters that relate to the operation of government. He added: “I think some of the notion about judicial activism or over-reach is almost always a misconception, because in times of political dysfunction in the legislature or the executive, the judiciary has got to step in, it’s got no choice. It couldn’t possibly throw up its hands in horror and say `we’re not going to get involved’ ”. Courts in Northern Ireland have issued rulings against the Stormont administration, including in 2015 over the failure to deliver an Anti-Poverty Strategy based on objective need. But a string of other high profile cases have also grabbed the headlines, exposing government splits on issues as wide ranging as LGBTI rights, language rights, access to abortion, and dealing with the legacy of the Troubles. Regardless of political controversy, Justice Cameron said that the fair application of the law would in time demonstrate a benefit to society as a whole. “One would hope that. I think that litigation in the public interest, rights assertive litigation, can play a very important part in that. “It certainly has in South Africa, both under Apartheid and under the Constitution. It’s made an enormous difference in South Africa. “We would not have had our publicly provided antiretroviral treatment programme for people with HIV and AIDS if it hadn’t been for litigation. 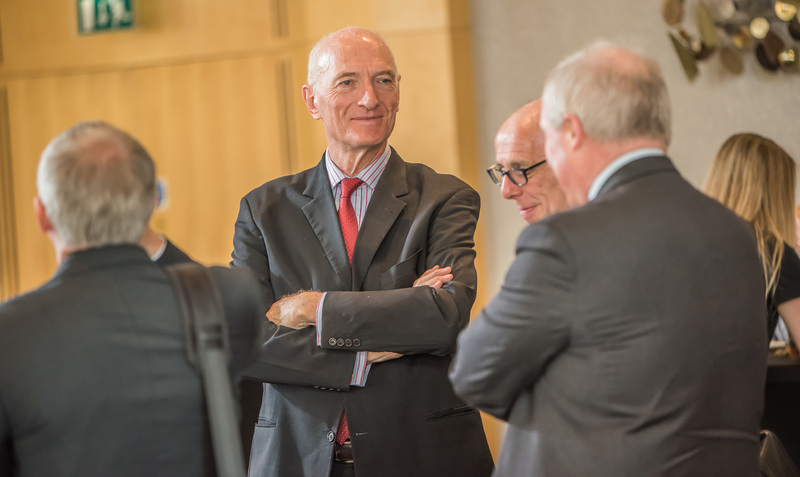 Justice Edwin Cameron meets delegates ahead of Thursday's conference at the Hilton Hotel Belfast. South Africa has been hit with political controversy since the optimism of the Mandela era, but Justice Cameron said he believed progress was possible. “South Africa has got very considerable problems. We’ve got inequality, we’ve got dispossession, we’ve got racism, we’ve got gender suppression and subordination, we’ve got landlessness, we’ve got institutional dysfunction. “So, all those problems are very real and many of them are quite frightening, but I think we have got the resources, the human resources and also the institutional capacity to right ourselves. We’re a middle income country. We can right ourselves. We have a president who is a formidably impressive person, President Ramaphosa who succeeds President Jacob Zuma. “So I think anyone who says South Africa has got very considerable problems is absolutely correct, but I also think that we have the resources to overcome most of the problems and of course, our biggest resource is the Mandela Constitution. It was Mandela’s gift to the country. “It is under reassessment. A lot of people are sceptical, they say the Mandela settlement wasn’t favourable enough to black people, it favoured white people too much. I don’t think that’s right. I think Mandela gave us a constitution that enables all the shifts and readjustments and reallocations and social justice appropriations that are necessary. But court challenges alone, he said, are no guarantee of social progress.